To celebrate the festive season, Lucy Angel has released two cover songs to ring Christmas in with style. It’s Beginning to Look a Lot Like Christmas and Last Christmas round out a busy year for the mother-daughter trio. The past few months have also seen the launch of singles, Yard Sale and Public Pool Party, both of which were added to premiere Spotify playlist, 'Wild Country' and garnered more than 580,000 streams collectively. Their docu-series, DISCOVERING LUCY ANGEL made its UK debut on SHOWBIZ TV, and it now seems an EP or full-length LP may not be far off either. 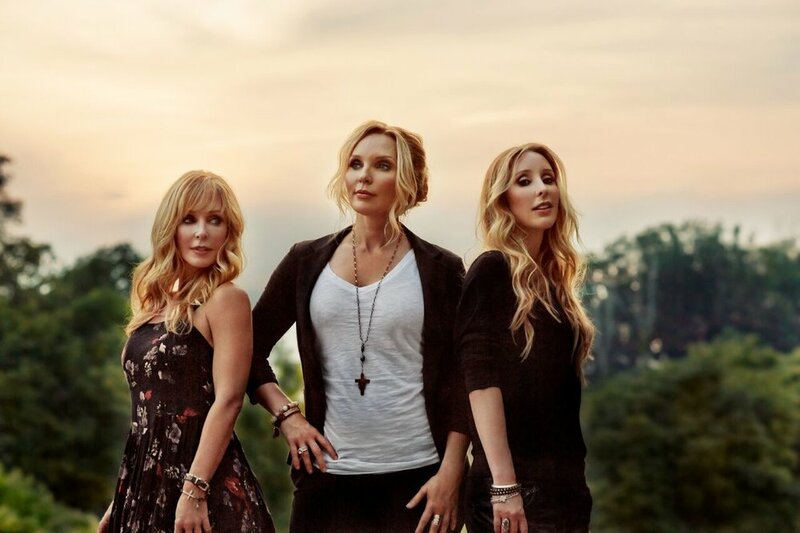 Lucy Angel - made up of Kate, Lindsay and Emily Anderton - chatted with Megan Gnad about their big year and what 2018 holds for the rising country trio. It’s been a busy few months for Lucy Angel! How did your latest single, Yard Sale come about and who did you team up with on the co-write? Emily: This song is probably the most fun writing session we’ve ever had. We were coming off releasing our single, Crazy Too, and we’ve become good friends with Summer Overstreet, so we invited her over and it was real laid back, just us hanging out. We invited our brother Jake in on the write, so we literally were goofing off, throwing around ideas and stumbled on this title, and we all loved it. An hour later the song was written. It was one of those that just fell out and came together. It was just a fun session. Instantly, when we first started playing it on (social media channel) Jammie Jam, they loved it. It’s one of our most requested songs on there now. You’ve also released the official music video for Public Pool Party. That looked a lot of fun to record and to shoot! Lindsay: It was a lot of fun releasing that this past summer and, oh my gosh, it was so fun and crazy at the same time filming that video. We used a GoPro that we were essentially swinging above our heads. We filmed it at a few different pools. We have some family in Arizona who made a rig with a GoPro for us, and then we filmed it at a couple of pools here in Tennessee. Our favourite was the one pool that was heated! You’ve recently teamed up with Summer Overstreet. What were those writing sessions like, and do you generally write on your own, or enjoy bringing in other people to work with? Emily: You hear, here in Nashville, that you have to find your tribe of writers you write your best with; that you click with. I think we have finally found our tribe and it’s the three of us, Summer Overstreet and our brother, Jake Anderton. You can just tell a different feel when you get with the right people, it just flows. Kate: We wrote with Summer on our last project when our label set us up with a bunch of different writers. There was something special even back then on that very first write that we just loved. We still enjoy working with other people, but it’s just different dynamics with different writers, and (with this team) we’ve come up with some really good songs. So, with all these single releases, does it mean you’re looking to release a full-length project soon? Kate: And then we keep writing new songs. It’s becoming a little bit of long EP, it could become an album really quick. Emily: It feels really good to not be tied down to old rules and release songs as they’re ready, because the exciting thing is to get the songs out there for people to listen to. When you have to wait a year for a whole album to be released, that can be really frustrating. So, this is liberating, there’s no rules and we can release as many songs as we want to and call it whatever we want to. Do you have a clear direction in mind of what it will look like, or are you taking a more organic approach? Emily: I think that we’re all really liking the direction we’ve taken Public Pool Party and Yard Sale. We have the next two singles we’re planning on releasing mapped out as well and we’re really happy with the vibe. Kate: There may be something that comes along that we want to put on the album that we haven’t written, but so far, it’s the first one we’ve done where we’ve really written everything on it. It’s very exciting for us. As artists, it’s great because it’s coming from you anyway, it’s not looking for a song you identify with that someone else wrote. Lindsay: We have a song, Econoline - that will be on the EP, or one of the next couple singles we release - that we wrote with Summer and Jake, about us growing up with this Ford Econoline. It’s so nostalgic. We grew up taking road trips in it as kids. We played this on our weekly live stream on Facebook, and Econoline is really connecting with fans. Kate: It’s just exciting when you’ve written a song, that’s close to you and about your life, and you find out people love it. Being a family group, do you find people want to hear those stories that are personal and mean something to you? Kate: Yeah, that’s part of what people identify with. Sometimes we get, ‘we would drive each other crazy (if I was in a group with my family)’, but they love it, too. The family dynamics, everyone identifies with. Emily: We honestly are so lucky to have such a supportive family. Our dad is our biggest fan and supporter, and our brother in Arizona used to be our road manager - we wore him out - and our other brother Jake, we work with in Nashville. Every member of the family helps make this possible and we’re really, really lucky. With your show Jammie Jam, Facebook and vlogging, you put a lot of effort into engaging with your fans. How does social media help get Lucy Angel’s message out? Emily: We have so much fun engaging with all our fans on all the different platforms, and we have some of the sweetest fans. It’s so cool being able to share content so quickly over the world. We record the video and with the press of a button, it can be all over the world. When you’re all on stage together performing, do you feel a magic that is hard to replicate with anyone else, other than the three of you? Emily: Definitely, for sure. It’s just that thing with the blood. And the fact you know each other better than anyone - you know when they’re going to take a breath. At what point did you discover the ability to perform such beautiful harmonies together? Lindsay: Well, it was interesting because we were a duo at first, my Mom and I. When Emily came into the group it was so cool because we had never sung just with the three of us. It sounded like magic when she joined us. We were like, ‘wow’! Emily: We all have very different sounding voices, but there’s this song on the record where I am singing lead and Lindsay is singing high harmony, which normally we’d do it the other way around, and I swear it sounds like me! It was really wild.